In this exercise the heating of a kettle will be modeled by building up a spreadsheet in Excel, starting with a simple no heat loss model then adding complexity by considering the heat given to the kettle then heat loss. This worksheet is written for student who have already grasped the basics of using Excel so should know how to add formula, insert graphs and use sliders. If you have done Projectiles in excel then you will have the required skills. The first thing to do is to set up a table with some values in it, these will be used in the equations. Put this table somewhere to the left of the spreadsheet, I used columns K and L, if you use the same then your equations will be the same as mine. Insert a scatter chart to display the change of temperature with time. Try adjusting the values of power and mass of water to see what happens to the graph. Note that the model doesn't take into account the fact that water boils at 100 °C however you can set the y axis so temperatures above 100 °C are not displayed. Add a value for the heat capacity to your table of values (say 1000 JK-1) and adjust the formula calculating ΔT accordingly. where k is some constant, the "heat loss constant"
Try adjusting the heat loss constant and room temp. to see what happens. Add sliders to make adjusting all the variables easier. To add sliders so you will need to make sure that you have the “developer tools” available. 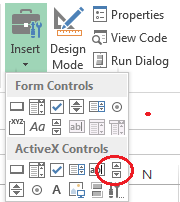 To do this, open excel and click file > options > customize ribbon > tick developer in the right hand box. You will now see the developer tab on the ribbon at the top. Note that not all versions of excel are the same but the process is similar. To add a slider open the developer tab and insert slider (its actually called a scroll bar) from the active x options. Insert the slider next to the value. To set the sliders properties right click it and select properties. If this doesn’t work you might need to click “design mode” in the developer tab. Link your slider to the relevant cell and set reasonable min and max values. Try sliding the slider to see if the values change.